Change can be scary and difficult; often, we get so caught up in the way we do things that when there is a difference in routine it can be hard to accept it and move on. But when we resist change, we are not welcoming a chance for something new and exciting to emerge. For example, when my college roommate of three years graduated early, I had to find a new roommate. I decided to move in with an acquaintance, but I was still daunted by the change and nervous that my new roommate and I would not get along well. However, once my things were in place in my new room and I got to know my new roommate better, I found she and I were quite compatible and we have since become good friends! By being willing to accept change, I discovered how many more unexpected possibilities can open up. Although at first it may be tough to go through a transition, I have realized it is crucial to not view my situation as purely negative. Instead, I need to look at what has happened as a stepping stone to new opportunities. While my roommate leaving was not in my control, finding and accepting a new roommate was and in taking a chance with an acquaintance, I have now developed a new friendship. By listening to your inner voice and paying attention to that energy and the actions that may result, you can get a better idea of what makes you truly happy. This can then lead you to make decisions based on your truth. As Puja writes: “Remember you are the protagonist in your own life, not the victim of it.” You have the power and control to make the decisions you want in your life and with this ability, you can really look at where you want to be and how this will make you feel. I think what Puja has to say is very powerful; not to sound too cliched, but you are the author of your own story and it is up to you to decide how you would like your life to play out. Keep in mind, you can always ask for help when things get tough. Support can be found in many different forms and when you reach out to others, you may discover a new insight or way of understanding your situation. At the end of Step Four in Track Your Truth, there is a guide that will help you create your own plan to find your truth, something only you can find when you are being open to yourself as you experience life. We can all use energy principles to change how we are feeling and how we think and act. We are energy beings, not just physical beings and we have internal senses that can guide us. Paying attention to them, you will also become more familiar with your emotional, mental, and spiritual self. An example of how you can use your internal energies is if you listen to the little voice inside your head; this voice is your self-talk. By tuning in to self-talk that is positive and healthy, you can encourage yourself with whatever task or goal that you are trying to accomplish. Sometimes, self-talk can even entertain you, especially when you use your imagination! If you allow yourself to have negative self-talk though, you leave yourself open to discouragement, gloomy, or even harmful thoughts about yourself. While it can be difficult to talk your way out of these dark places, it can be done because you have the power to change how you feel and what you tell yourself! In my own life I have to remind myself that I have the ability to change the direction of my thoughts and feelings to more optimistic ones. For example, when I have to give an oral presentation, I get anxious and my self-talk becomes negative; I tell myself I will probably stumble over my words, stutter, or say something incorrect. So, instead, I tell the voice in my head to think positively and confidently. I say things such as, what I am presenting to the class is helpful and informative and that I have worked hard and know what I’m talking about. This not only changes my mood but it also improves how I feel physically. When nervous, I tend to breathe heavily and my voice shakes, but as I talk encouragingly to myself, my breathing calms down and I become steadier. In Track Your Truth, Puja writes: “Just a little bit of self-confidence can make a huge difference and can help you seize opportunities in front of you…The really good news is that we can develop inner strengths such as resilience, confidence, and insight by actively decreasing our focus on the negative and increasing our focus on the positive.” Simply by transforming your thoughts, you can improve your entire outlook on who you are and how you want to feel. With skills like changing the way you speak to your inner self, you can improve your understanding of your internal senses and energies. When this happens, you can develop a greater sense of how interdependent your thoughts, feelings, spirit, and body are. "TRACK YOUR TRUTH" SNEAK PREVIEW OF STEP TWO: FOCUS ON YOUR "HEAD, HEART, HAND, & HUNCH"
The body is incredible and what we often overlook is how each memory it stores has a feeling, both emotional and physical, to accompany it. With this in mind, it is important to remember that your emotions can influence your physical state of being. The way you feel emotionally can cause your body to react in a physical way. For example, sometimes my stomach feels queasy but this does not always mean I’ve eaten something bad or have a cold. Instead, this physical sensation can be connected with an emotion like anxiety or nervousness. I also think it is important to acknowledge what Puja writes: “Since everything that has happened to you is stored in your body, memories of all the events in your life including your feelings may be hidden from your consciousness, but they are not lost. They may resurface later.” Every feeling, intuition, or hunch you experience is important, no matter how small you think it is. If you ignore or repress these clues, both physical and intangible, this could have negative effects. All aspects of yourself are valid, and the sooner you acknowledge and listen to them, the easier it will be to live your truth. Paying attention to what is happening in your body will help you track and live your truth. When you focus on what your body is telling you, you will pick up on its signals sooner. By quickly responding to a pain or an off-feeling, you not only take care of your physical being, but your mental and emotional self as well. Connecting to your body and acknowledging the signs it presents to you can also help you when you interact with others. For example, your gut feelings will tell you who to trust and who to be wary of. Instead of relying heavily on others to tell you how you are feeling or how to feel, knowledge of your body will lead you to make your own authentic decisions. I find it is easy to become preoccupied with what I am involved in that I forget to take care of not only my mind, but my body. As a busy, and often overwhelmed student, all too often do I ignore the signs my body makes when it needs some tender love and care. It can be difficult to drag myself away from an assignment, and sometimes it gets to the point where I can feel my eyes drooping while reading or hear my stomach growling. When these things happen, I know it is time for a break, so I will go for a walk or have a snack like an apple. My body is my home, a vessel that will be with me for a very long time and needs the attention it deserves in order to flourish. One aspect in Puja’s new book, Track Your Truth, that stands out to me is when she writes: “If you’re not connected to yourself, someone with a strong negative influence is more likely to take advantage of you. In an unbalanced state, you may be influenced by the persuasive demands, needs, or wishes of others who do not have your best interests at heart, and thus lead you to make decisions you may regret later. It is not safe to pay more attention to others than to yourself.” I think this last sentence is very significant; it really resonated with me and is something that readers, and I myself, must remember. In Puja A.J. 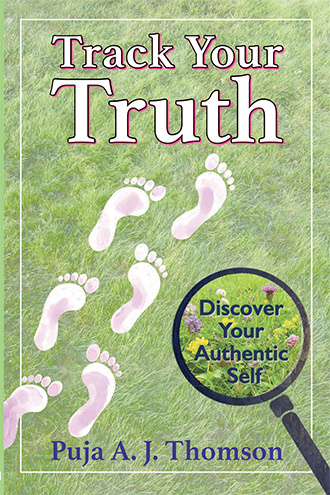 Thomson’s upcoming book, Track Your Truth: Discover Your Authentic Self, she guides the way to you leading your best, most meaningful life. Throughout her writing, she explores the ways in which you can be a detective of what works and what doesn’t in your life, and how this can affect the way you live. Puja helps you to learn how to welcome change and create healthy habits, all of which will aide you in learning how to live your truth. Her book is broken down into four helpful steps – Step One: Start with your Miraculous Body, Step Two: Focus on Your “Head, Heart, Hand, & Hunch,” Step Three: Tap into Energy Principles, and Step Four: Welcome Change, Live Your Truth. Within each step there are chapters that outline different aspects that will bring you closer to truly understanding and connecting with your mind, body, emotions, and spirit. These steps will teach you how to focus your own energy, and in the end, show you how important it is to listen and acknowledge your true self. I had the privilege of getting a sneak peak at Track Your Truth. I will discuss the parts that stood out and resonated with me the most in four blogs, each dedicated to one of the four different steps. In the meantime, have a look at the Coming Soon! section under the “Store” tab on the Roots & Wings website, to see Advanced Reviews for Track Your Truth. Stay tuned – each week I will be posting blogs about the four steps!